If you've got a teething child, you'll want to check out this award winning teething aide. 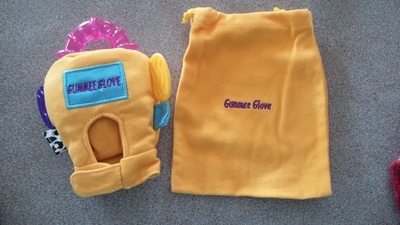 What is the Gummee Glove? 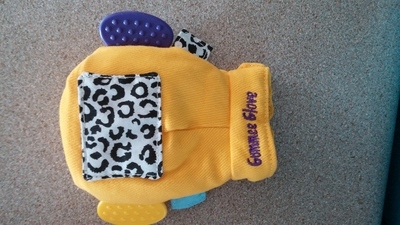 The Gummee Glove is a unique teething toy that is designed to fit your little ones hand like a glove. It has multiple protrusions, taggies, a crinkle patch and a pocket to hold the water filled teething ring (for older babies). For use by babies over 3 months of age. 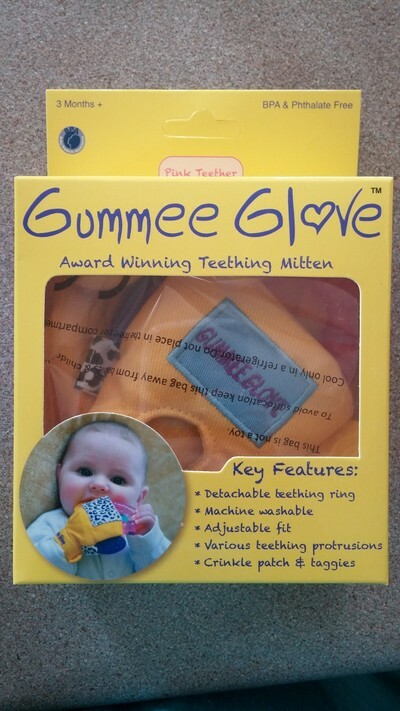 The Gummee Glove has various teething protrusions. Crinkle patch and taggies to teach your baby about cause and effect. Detachable teething ring (pink or blue in colour) - designed to be added once the baby is used to the glove and when their bigger teeth start to come through. This ring can be chilled in the fridge. 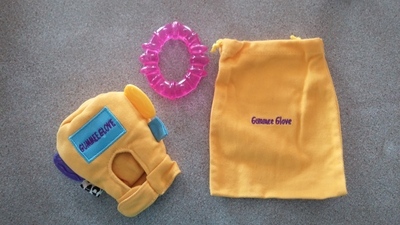 The Gummee Glove with the teething ring in place. Handy laundry and travel pouch. My 7 month old was constantly throwing her normal teething rings on the ground - in fact, it had become a bit of a game to her where she would get frustrated when she could no longer reach it. The Gummee Glove was the obvious solution. Its unique design offers babies numerous textures to grind their gums on and help ease the ache of teething and due to its innovative nature, it can stay on a childs hand and not keep getting dropped on the floor. Typically, you'd introduce this product to your child when they are around 3 months. When I introduced this product to my daughter at 7 months, she was therefore much more knowing and a little dubious about attaching it to her hand. So, at first I just let her play with it to familiarise herself. Then, I popped it onto her hand, without the teething ring to give her an opportunity to get used to it. 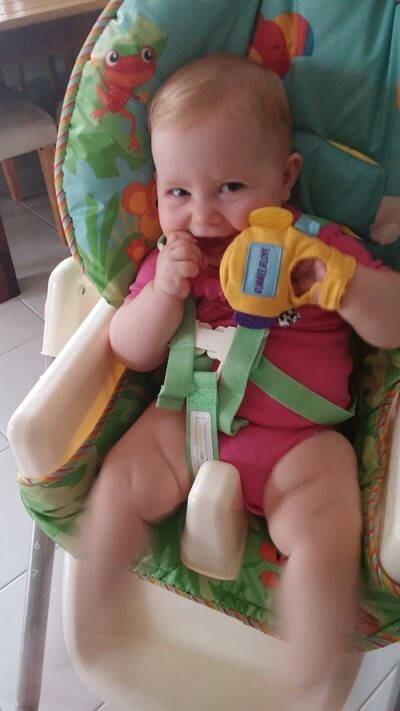 She soon got the hang of it and enjoyed exploring its features and the feel of the protrusions on her gums - I then added the cooled teething ring. She loves it now. My daughter enjoying her very own Gummee Glove. It's so compact and is a breeze to take out with you, storing it in the handy laundry and travel bag. I would recommend this product to anyone with a teething baby! This would be a great gift to buy a new mum or to take along as a baby shower gift; something that parents will thank you for the moment teeth start coming through.